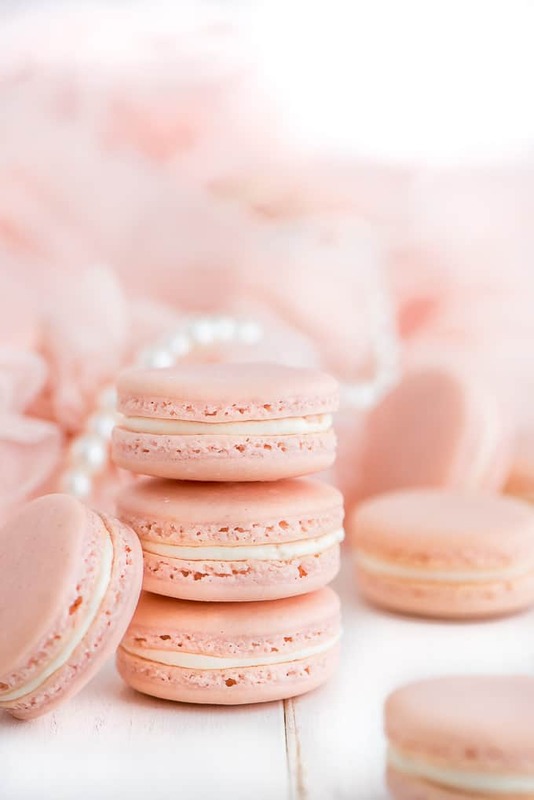 These Classic French Macarons so elegant, making them the perfect treat for fancy parties and gatherings. 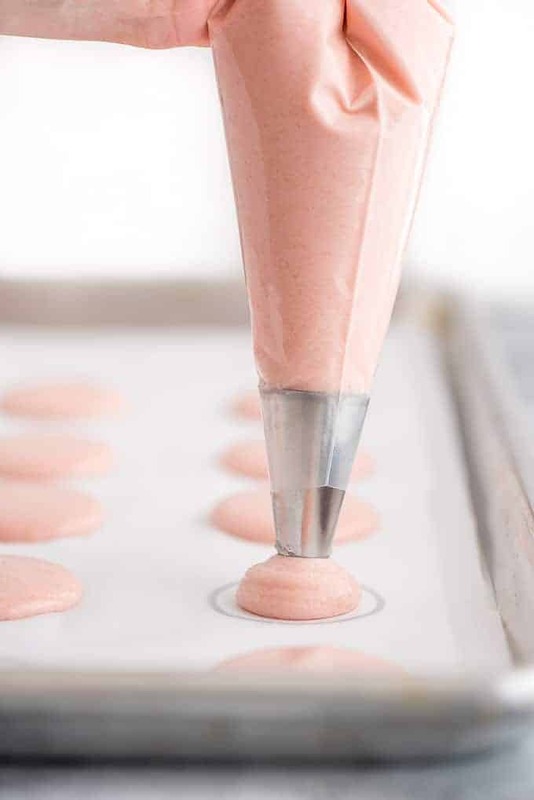 By following these tips and recipe you’ll be a pro macaron baker in no time! Don’t miss my Lemon Raspberry Macarons too! There are a couple ways to make macarons but the French method is a little easier for the average baker. 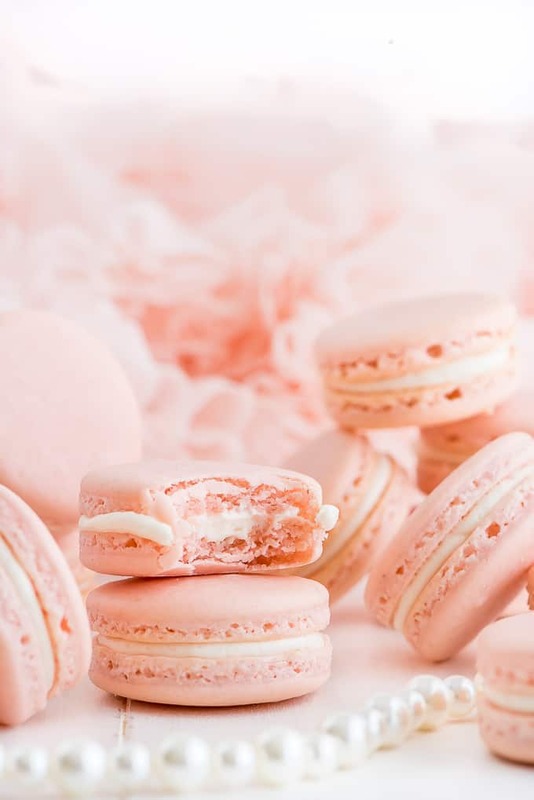 Macarons are known for their signature smooth shiny crisp top, chewy inside texture, those ruffly edges called “feet”, and the scrumptious filling mushed in between two cookies. Creating these cookies is a science and unfortunately, we’re not all baking in the same kitchen with the same exact ingredients, temperature, humidity, oven temperature… Even making these cookies in the same kitchen but at different times of the year or day can alter results which is why some consider these cookies to be quite the headache to make. But I have video for you as well as detailed isntructions. We can do this! Weigh your ingredients! Using measuring cups is not very accurate since there is room for variations in how much one can pack into a measuring cup. Use room temperature eggs. Room temperature eggs are easier to whip to create the meringue. You can set them out a few hours before making the cookies or place them in a bowl of warm water for 5 minutes. Beat the egg whites and sugar just until they read stiff peaks. If you overbeat it will start to separate. If adding color or extract you need to add it at the soft peak stage so that it can mix all the way in before you reach stiff peak stage. Use gel food coloring. Using liquid food coloring affects the dry to liquid ratio so gel is best. Sift! You must sift the flour and sugar a total of 2 times each. This ensures you don’t have any clumps so that everything will mix evenly. Fold, don’t stir. 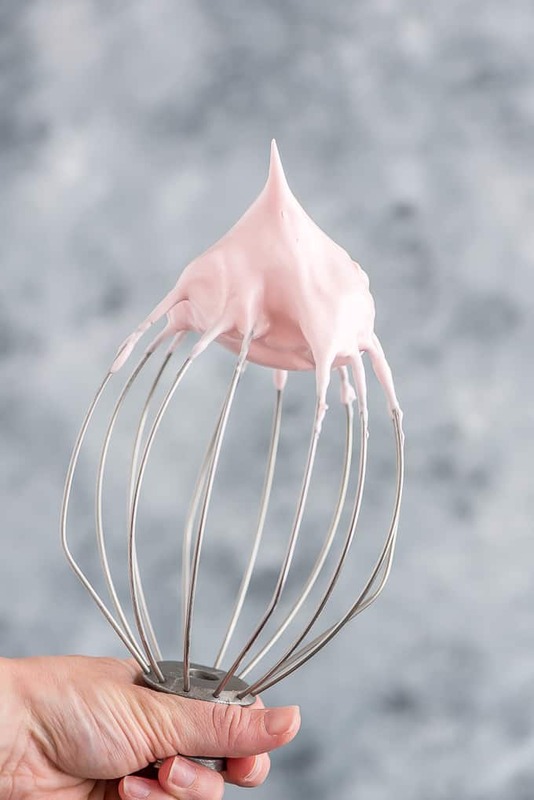 After you sift the ingredients on top of the meringue, use a rubber scraper to fold the meringue up from the bottom and sides of the bowl to on top of the dry ingredients. Keep repeating, turning the bowl as needed. The mixture will be thick at first but as you keep folding it will begin to thin. Occasionally test the batter while folding to see if it drops from the spatula slowly like lava. 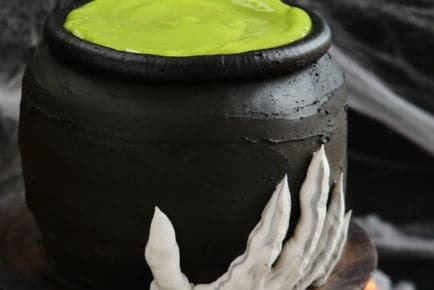 You should be able to slowly drop it back into the bowl, forming a figure eight that disappears back into the rest of the batter in 10 seconds. Stop folding and then place in a piping bag with a round piping tip. Line your baking sheet with parchment paper and place TEMPLETS(click here for pdf) underneath. This will help you get create uniformly sized macarons for sandwiching together. When piping, hold the bag vertical and gently apply pressures until the blob of batter reaches the inside like of the circle. Stop applying pressure and pull the bag up while moving it in a swift circular motion so as to not create a big point with the batter. 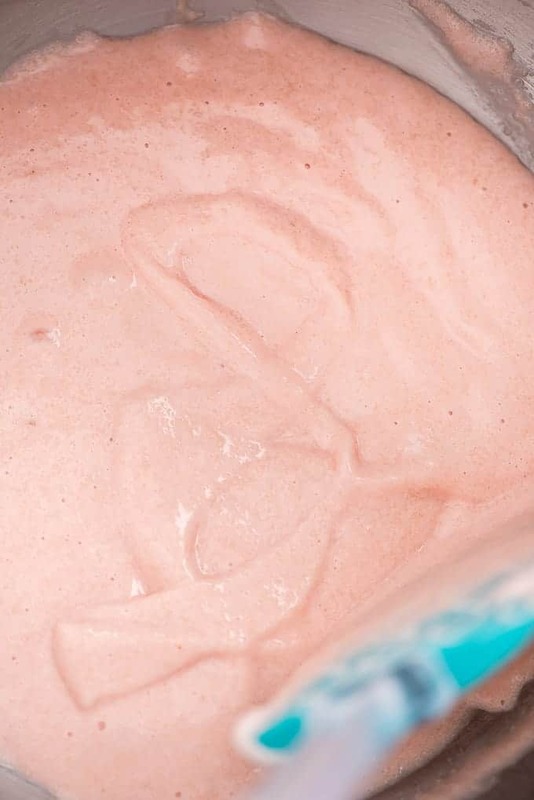 The batter is somewhat fluid so you’ll need to quickly move to the next circle and repeat until you’re out of batter. Tap the pan. Pretty forcefully, tap the pan on the counter to get any air bubbles to come to the top and pop. This will prevent your macarons from cracking when baking. Be patient and let them dry. I live in a humid place (80-100% humidity) and I always let my macarons dry for 45-60 minutes. They are ready to put in the oven when you can touch the top of the batter and it is no longer wet or sticky. Bake the macarons for 20 minutes and then let them cool on the pan 5 minutes before sliding the parchment onto a cooling rack. If you don’t bake your macarons long enough they will collapse and look wrinkly and be a little difficult to get off the parchment paper. Let the cookie shells cool completely before applying filling. Pipe on a little filling (1-2 teaspoons) and then twist another shell on top to help it stick together better. Macarons can be kept at room temperature in an air-tight container for a couple days if the filling isn’t perishable. If you refrigerate them they’re good for 3 days or you can freeze them up to 3 months. Let the cookies thaw for 5-10 minutes on the counter after removing from the freezer. These cookies will definitely wow your family, friends, and guests. Serve them at your next special occasion or celebration! 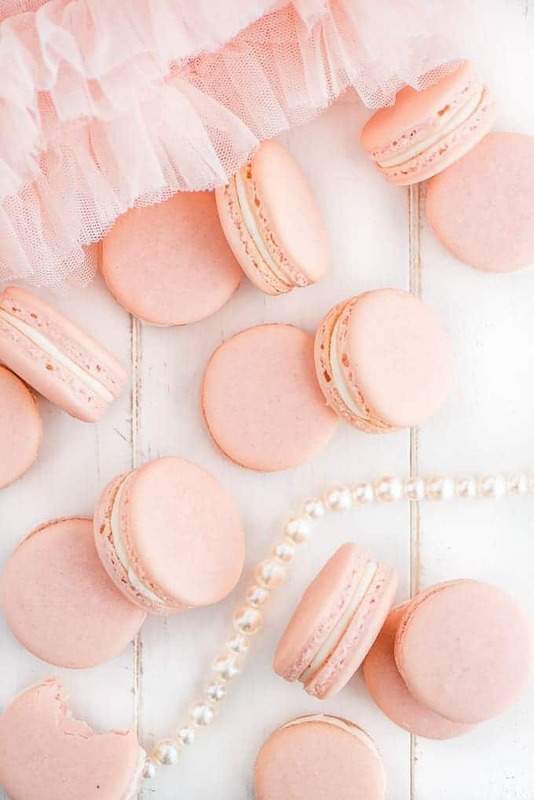 These Classic French Macarons so elegant, making them the perfect treat for fancy parties and gatherings. 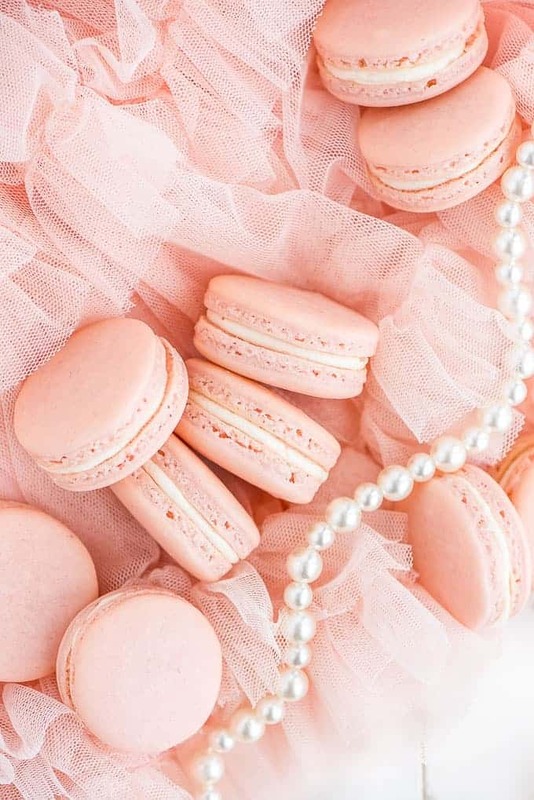 By following these tips and recipe you'll be a pro macaron baker in no time! Sift the almond flour and powdered sugar together and set aside. In the bowl of an electric mixer with the whisk attachment, beat the egg whites on medium until foamy. Add in the cream of tartar and salt. Continue beating and add in about 1 tablespoon sugar at a time. Increase speed to med-high and mix until soft peaks. At this point you can add the vanilla and food coloring. Continue mixing until stiff peaks. Remove the bowl from the machine. Sift the almond flour and powdered sugar again but into the bowl of the meringue. Using a rubber scraper, gently fold the ingredients together by scraping the sides and bottom, folding the meringue up onto the dry ingredients and pressing down. The batter will thin up as you mix. You are done one you are able to have the batter slowly drop back in the bowl making a figure 8. The batter will drop like molten lava and will dissolve back into the batter within ten seconds. Spoon batter into a piping bag fitted with a A2 round piping tip. Line a baking sheet with parchment paper with templates underneath. Holding the bag vertical, gently squeeze the batter out until batter reaches the inside line of the circle on the template. Release pressure and lift the bag up with a quick circular motion and then move to the next circle and repeat. Once all the batter is piped, slam the pan down on the counter a few times so that all the air bubbles are released. If you see some air bubbles at the top you and pop them with a toothpick. Let the batter dry for 45-60 minutes. For humid climates or rainy days, aim for 60 minutes. About 10 minutes before drying time is up, preheat the oven to 300 degrees F. Bake for 20 minutes on the middle rack and then remove from oven and let cool on the pan for 5 minutes. Then slide the parchment paper onto a cooling rack. Fill once completely cooled. Cream the butter, powdered, sugar, milk and vanilla together for 2-3 minutes until creamy. Remove beaters and stir with a rubber spatula for a couple minutes to get out air bubbles. Place in a piping bag and apply 1-2 teaspoons filling to the bottom of a shell. Place the bottom of a second shell on top and squish together with a little twist. Melanie, from Garnish & Glaze, is a Midwest girl currently living on Long Island with her husband and two little girls. She fell in love with baking and cooking as soon as she discovered how yummy banana bread batter is. She loves spending time in the kitchen creating healthy dinners and indulgent desserts. How many carbs is in a macaroon? Fort the first time, I made macaron yesterday, using this recipe. Overall, my shells came out well, with good feet and a nice crunchy and chewy texture. They were unfortunately also overcooked and came out with a bit of browning. Speaking with a more experienced friend, she suggested checking on baking macaron at 13 minutes with the expectation that they’ll require a bit more time. She thought that 20 minutes we significantly excessive (which my experience supports). Should have added to my previous comment that I’m uncertain about the recipe’s stated “24 servings.” Is this 24 half-shells or 48 half-shells? I think that I got about 30 from 62 grams of egg white. My 11 year old daughter made these and they turned out great!!! Hi, can the powder and granulated sugar be replaced by erythritol? Since they are sweeter and require less it might affect the consistency? I made this recipe and it was amazing! I wanted to make a chocolate macaroon. Do you have a recipe that you use for that? Or how would I adjust this recipe for a chocolate macaroon? 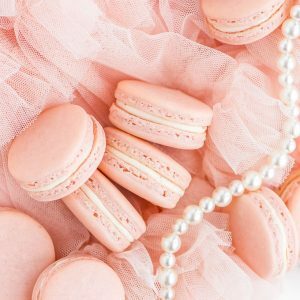 The best instructions on how to make macarons, thank you! I loved these more than the ones in the bakeries. Do you recommend doubling the batch or to make 2 separate batches? StevenHB: I got 24 halves or 12 macarons. 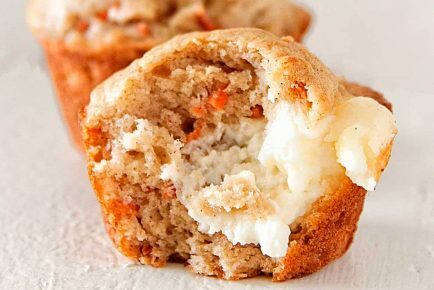 Any alternative to almond flour since we have a nut allergy? What powder sugar we need? Icing sugar?? I’ve made several batches of macarones following this recipe. It works wonerfully! But beware: making and eating macarones is highly addictive! LOL Thanks for a well written and well videoed recipe. I am sure the recipe is fine but I am unable to make these right. I am very frustrated that I cant figure out what is it that Im doing wrong .I did everything by the recipe, tried to make adjustments . Nothing works ! They either don’t have feet whether I over-mix or under mix ..or they crack . Some times they r flat as pancakes . Or bumpy on the surface. Reading about troubleshooting doesn’t help. It can be just about everything. I am experienced baker but this is just the most annoying thing to make . And all these tutorials make it seem its that easy. Well it is not . How many cups is 80 grams (the almond flour), 85 grams (the powdered sugar), and 50 grams (the granulated sugar)? I don’t do grams, so this was really confusing for me!